It was our last few hours in Fabulous Las Vegas, it was lunchtime, and we wanted our last meal to be unforgettable, but we had no reservations and no plans. 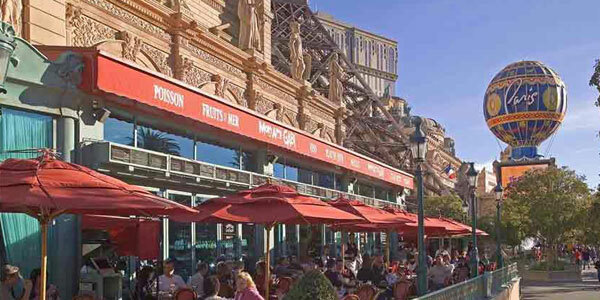 We were walking down the beautifully busy Strip and enjoying our last stroll in Sin City when we saw this little French bistro right next to the Eiffel Tower restaurant of the Paris Hotel. It caught our eyes instantly. It was almost full house, with many customers waiting to be seated. 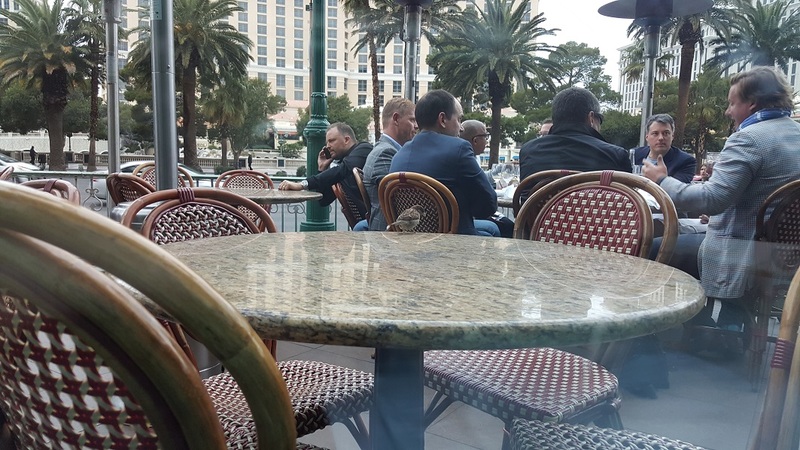 A few raindrops didn’t seem to bother the people enjoying their drinks and food on the terrace of this little enchanting restaurant which faces the stunning Bellagio fountains. It seemed to us like a perfect setting for a romantic farewell lunch, and it was almost too good to be true. I was craving a really good steak, and the sight of the platters landing on each table made my mouth water. We approached the waiter and asked if we could get a table for 2 on the terrace. He apologized and said they were no longer seating customers outside because it was starting to rain and they might even ask the people already sitting outside to move to the indoor area. Mon Ami Gabi probably has the best location and the best view, we were hoping it would also have the best food, too. So, we waited for 5 minutes and then we were seated, inside, but the closest possible to the outdoor view. A delicious, crunchy and chewy French loaf with some butter landed on our table. Typical, you might think? Well, maybe you’re right, but believe me when I say that this was one of the yummiest breads I’ve tasted! 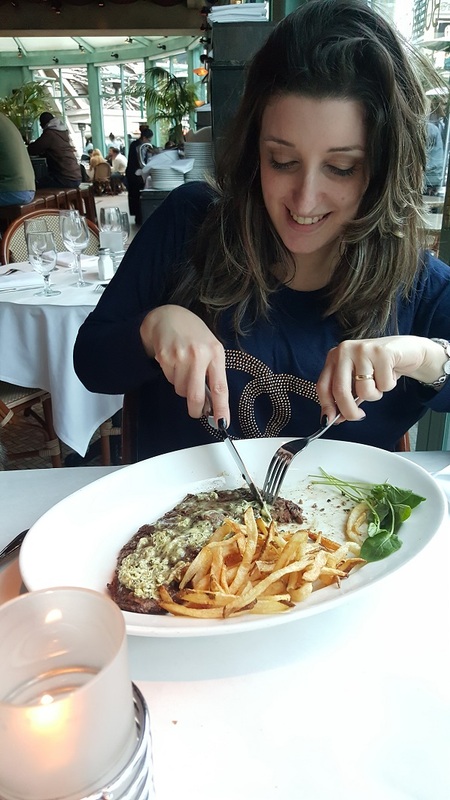 We took a quick glance at the menu, and then I ordered the Steak Frites Classique, medium well. 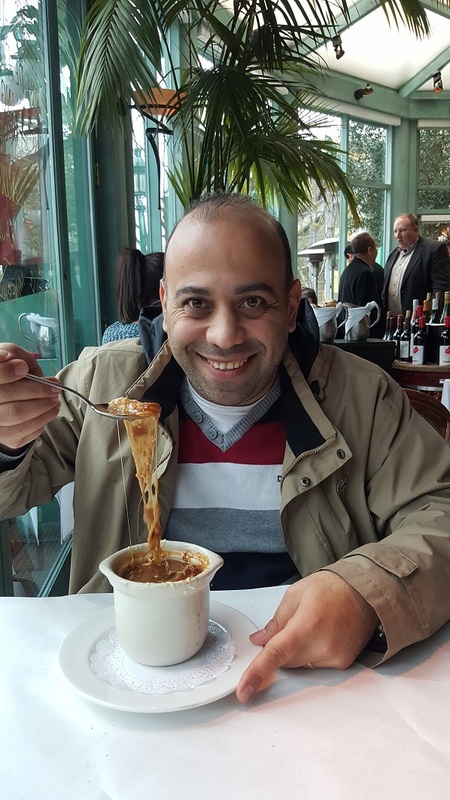 We saw one item landing on each and every table of this bistro: it was the classic French onion soup (soupe à l’oignon au gratin). Wow! I thought to myself “this must be the place’s most popular item and that’s why everyone is ordering it”. So, without even thinking twice, we told the waitress we wanted one of those gooey, cheesy, bubbly ramekins of deliciousness. Everyone around us were drinking. The waitress thought it was weird that we did not order any drinks with our food. Frankly, I am not a frequent drinker, and definitely not in the daylight. So we kept it light and simple. In no time, the soup and the steak were served. They looked so good we didn’t want to eat them! Let me start with the soup: you try to take a spoonful and it comes out cheesy, piping hot with heavenly aromas. It probably had more cheese than soup, perfect! Just the way I like it. The taste is on another level, and it might seem like a small portion at first, but it is filling, I promise! The best part? It’s only at $10.95! Now, the moment my knife touched the steak, it cut through it like melted butter. You can’t but do that in slow motion to have the ultimate enjoyment! One mouthful, slowly chewing the extra tender and flavorful meat, and I was transported to a world of steak perfection. The cherry on top? 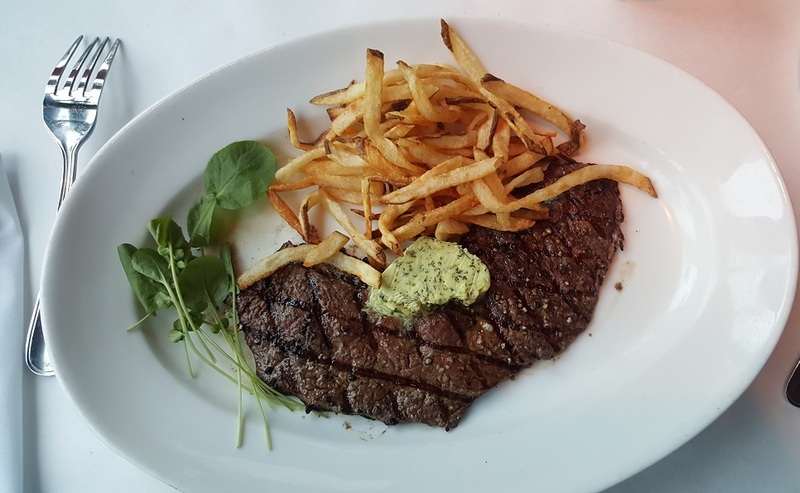 That has to be the generous portion of hand cut fries, fried to golden perfection, that accompanies the steak which comes topped with herb butter alongside some greens. Perfection in simplicity. What more could one ask for? This dish is at $27.95, but the smile it leaves on your face is priceless! We left the place with full tummies, smiling faces and beautiful memories of a wonderfully romantic lunch date on the ever-so-lively Las Vegas Strip. What could possibly beat that? Every time I remember this lunch, I close my eyes and simply smile and, no, I am not exaggerating. What made our experience even more enjoyable is the super amazing staff. They were the most professional and courteous waiters I ever encountered in my entire life, and that is not a compliment by any means whatsoever. For anyone visiting Las Vegas and willing to have a perfect culinary experience, I strongly urge you to put this place on your must-visit list. Make it a priority, even! You’ll thank me later. 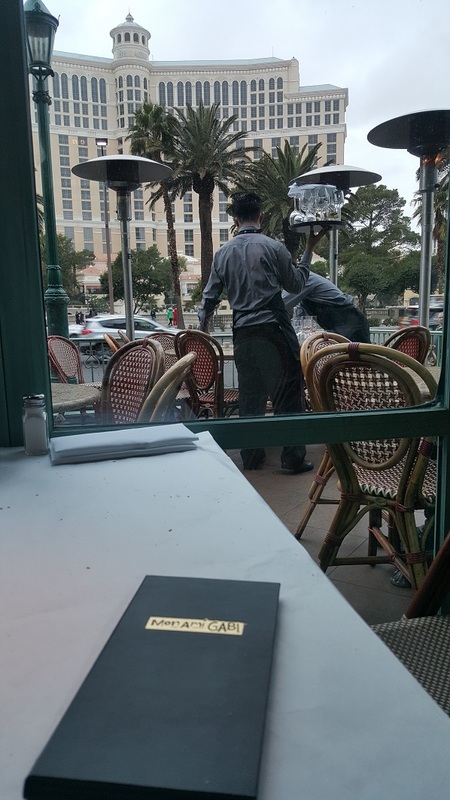 Went a couple of times to Mon Ami Gabi, for breakfast and dinner, and enjoyed it thoroughly as well. A great Vegas experience! It is indeed! I simply loved it. Definitely going back!